Long time no post! I’ve well and truly finished Against the Day (gaze upon the list and tremble), but this one’s actually from Mason & Dixon. It’s just been sitting in my fridge too long. Spruce beer is a not-always-alcoholic beverage brewed with buds or needles from spruce trees. Wikipedia reckons it was first drank by Indigenous groups in North America, who put European sailors onto the stuff. It appears in the 1796 edition of American Cookery, where it’s made from spruce, hops, and mollasses fermented with the “emptins” or leftover yeasty sediment of a previous brew. The Purveyor of Delusion confers upon his wife a certain expression or twist of Phiz I daresay as old as Holy Scripture,— a lengthy range of Sentiment, all comprest into a single melancholick swing of the eyes. From some personal stowage he produces another Flask, containing, not the Spruce Beer ubiquitous in these parts, but that favor’d stupefacient of the jump’d-up tradesman, French claret,— and without offering it to anyone else, including his Wife, begins to drink. The French claret will have to wait for another day; I’ve got Spruce beer. Drunk Pynchonette noticed it in a bottle shop when we weren’t even looking. And in honour of Dixon, this one’s not from Maryland but Scotland. 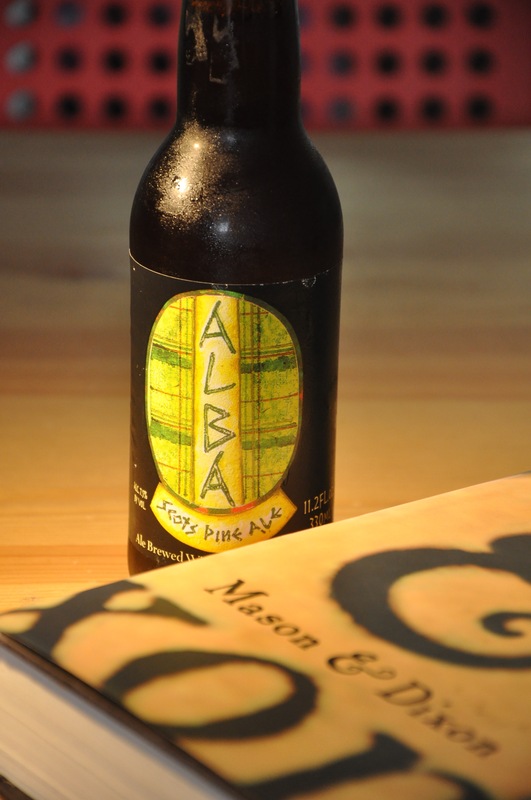 It’s the Alba Scots Pine Ale. The nose is bready and yeasty with fruity barleywine notes. HEAPS of sediment hanging in suspension. Tastes like a barleywine, alcohol and raisins and berries, with a chewy stickiness and some yeasty notes softening it out. There’s no real bitterness, but it is kind of spicy on the back. I can’t personally say where exactly the spruce sits in that mix. There’s a lot going on. I’m getting some what I want to call sap-like flavours as I get further in, but that could be entirely down to my increasingly drunk imagination. Weird beer. Fascinating beer. Thanks Pynchon.